Long time Ceremonialist. Professional Crafter of creative, meaningful Ceremonies. Award-Winning Marriage Celebrant. Passionate Advocate for Equality. Wordsmith. Published Writer. Voracious Reader of Books. Expert Reader of People, and Situations. Thanks so much for stopping by. Please feel free to call me Jenny. All my friends do. I hope that the very comprehensive information on my website (don't miss reading my blog!) will be useful and that, very soon, we will be having a chat about how, together, we can make your hopes and dreams for your special day, a reality. Making the decision to become a marriage celebrant 14 years ago was one the best I've ever made. It is both a privilege and a pleasure to work with couples (and individuals) to turn your hopes and ideas into a beautiful, meaningful, ceremony that speaks to your hearts, the hearts of your friends and loved ones, and makes your day a true reflection of who you are. I hope that we will become firm friends as we work together to create a ceremony that is a perfect mix of laughter and tears, of serious words and light-hearted expressions, of words to listen to, actions to look at, symbolism to internalise, and interaction between you and your guests as well as between your guests and me, your celebrant. What do I do that sets my ceremonies apart from the rest? I make it easy to have the Best. Ceremony. Ever. Getting married, or organising a ceremony to celebrate a significant life event, shouldn't be difficult. I not only work hard to make the process straightforward and focused on what you want and on how you want your ceremony to look and feel, what I do and how I do it is truly different (but not in a weird way). How is the way I do it different? Quite simple. Most ceremonies, wedding ceremonies especially, start with a pre-determined standard structure to which you might add some personalisation to put your stamp on the ceremony. I turn that on its head, because, in order to make the ceremony truly yours, and really about you, we need to start with you. Who you are, what makes you tick, what dreams and ideas you have. We allow that to inform, guide, and determine the structure of the ceremony. And that applies equally regardless of whether it is a wedding, commitment, naming, renewal of vows, or other ceremony. to DESIGN a ceremony that is everything it could be and should be because life’s too short for boring! And along the way I give you much more ... more Time, more Attention, more Creativity, more Information, more Resources, and more Autonomy ... a wealth of ideas, knowledge, suggestions, and all the freedom you need to have a ceremony that is everything it could be, and should be. I tend to think outside the box, and I encourage you to do the same. So I am open to making whatever you come up with, happen. I genuinely care about your ceremony, and about you, so I will give you more assistance and information than you might be expecting, including all the knowledge that is in my 11 books (so far) on different aspects of wedding ceremonies. And I have the wisdom and life-experience to do this in a way that is practical, respectful, and inclusive. Being a celebrant is my only job. I am also completely independent of any venue or other service provider, therefore my loyalty is 100% to you, and my focus is 100% on you. The ceremonies I create and officiate are relaxed, but not chaotic, carefully planned, but open to spontaneity, and always designed to be lovely to look at, so your photos and videos will be fantastic. I welcome all clients with open arms - regardless of who you are, who you love, or where you come from. In the planning phase, I explore with you all the possibilities for an entertaining and engaging ceremony. I firmly believe that getting married, or organising a ceremony to celebrate a significant life event, should not be hard. I make sure the whole process is straight-forward and focused on what you want to achieve on the day. 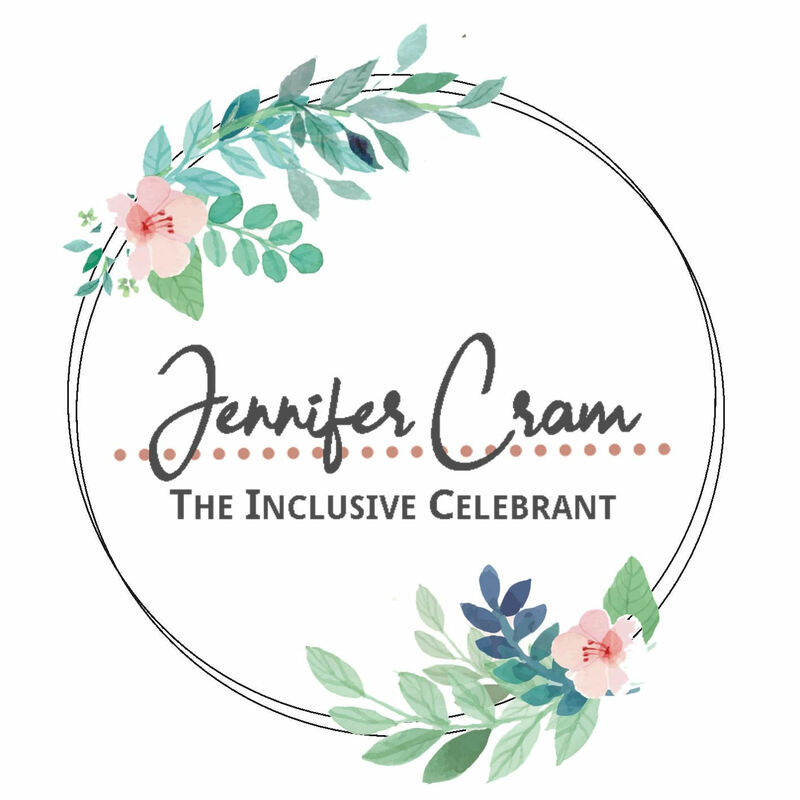 So, with me as your celebrant the lead-up to your ceremony will be relaxed, stress-free, and fun. Whether you are planning to have the full white wedding ceremony experience, or just get married in a very simple ceremony that is nonetheless original and personal, or a naming ceremony that truly celebrates not only your child, but your family, or a renewal of vows to celebrate the success of your marriage, or some other ceremony, I really will deliver a ceremony that is fresh and exciting and will touch the hearts of everyone present. I don't just wing it on the day! I prepare every ceremony carefully, with lots of input from you. I don't have my head in a script the whole time. Interaction and speaking from the heart are both features of the ceremonies I work with my clients to create. I make sure that your guests feel very much part of the ceremony. I work very hard to provide you with top quality, personal service that delivers on your dreams. This has been recognised over many years of making the finalist lists for awards for both Queensland's and Australia's top marriage celebrants. I make sure that ideas of tradition, or possible misunderstandings about what is required to make sure your marriage is legal, do not prevent of inhibit you from thinking outside the box (or for that matter, pretty well throwing the box away). For example, did you know that the celebrant doesn't have to do all the talking, be centre-stage for the whole time, or talk about themselves in the ceremony?